2019 CILA Native Law Student Scholarships! 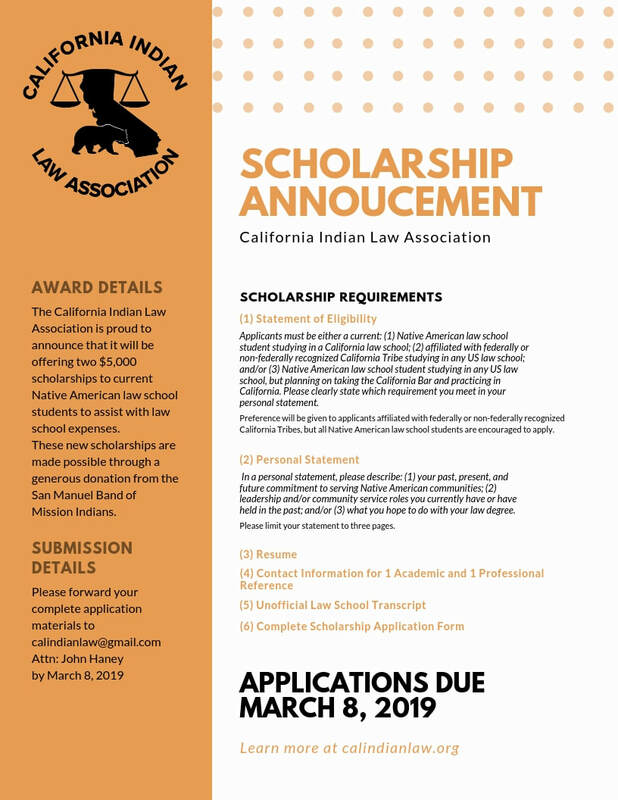 The California Indian Law Association (CILA) is proud to announce that it will be offering two $5,000 scholarships to current Native American law school students to assist with law school expenses. These new scholarships are made possible through a generous donation from the San Manuel Band of Mission Indians. Applicants must be either a current: (1) Native American law school student studying in a California law school; (2) affiliated with federally or non-federally recognized California Tribe studying in any US law school; and/or (3) Native American law school student studying in any US law school, but planning on taking the California Bar and practicing in California. Please clearly state which requirement you meet in your personal statement. Preference will be given to applicants affiliated with federally or non-federally recognized California Tribes, but all Native American law school students are encouraged to apply. In a personal statement, please describe: (1) your past, present, and future commitment to serving Native American communities; (2) leadership and/or community service roles you currently have or have held in the past; and/or (3) what you hope to do with your law degree. Please limit your statement to three pages. Description or documentation of your tribal affiliation. Provide the contact information for (1) one academic reference and (1) professional reference. Please email all application materials to John Haney at calindianlaw@gmail.com by March 8, 2019. Thank you for applying for the 2019 CILA 3L Diversity Scholarship! CILA is proud to offer a 2019 3L Diversity Scholarship in partnership with California ChangeLawyers (formerly California Bar Foundation). Thank you to the San Manuel Band of Mission Indians for your generous donation! CILA is proud to announce that it will offer additional scholarships in 2019. These new scholarships are made possible through a generous donation from the San Manuel Band of Mission Indians. Thank you for supporting the next generation of Native attorneys in California! The California Indian Law Association (“CILA”) is proud to announce its 2018 3L Diversity Bar Review Scholarship recipient, Mr. Dylan Rain Tree. For the second year in a row, CILA has partnered with the California Bar Foundation to offer this scholarship opportunity. This year’s scholarship provided a monetary stipend to assist with the costs of living and studying for the California Bar Examination. Mr. Rain Tree is an enrolled member of the Dunlap Band of Mono Indians, a graduate of the Sandra Day O’Connor College of Law, Arizona State University (Spring 2018), and is currently working from Fresno, California as a law clerk for Titla & Parsi, PLLC, a law firm which specializes in, among other things, Federal Indian Law and Tribal Law. He previously interned with the Office of the Prosecutor at the Gila River Indian Community, was a summer law clerk at the Native American Rights Fund, and was a judicial extern for the Arizona Superior Court, Maricopa County, Civil Division. CILA is proud to announce Mr. Rain Tree as this year’s Scholarship recipient, was proud to help support him through his bar studies, and wishes him the best of luck in his endeavors. CILA extends special acknowledgement and appreciation to the California Bar Foundation for matching the funds for the Scholarship and providing the leadership and infrastructure for these important 3L Diversity Scholarships.